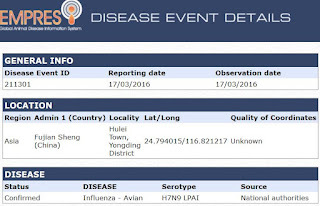 The above FAO notification appears to corroborate the media reports over the past 24 hours of a fresh H7N9 case in Fujian Province. Prior to this case, HK's CHP had been notified of 6 H7N9 cases in Fujian Province this winter (since Oct 1st). BEIJING, March 30 Nanping Electric (Li Simin) According to the Fujian Nanping City CDC reports, the city under the jurisdiction of Jian'ou recently confirmed H7N9 infection in a human patient, the patient's condition is relatively stable, and gradually develop in the right direction . It is reported that the patient who lives in Jian'ou town, the home did not raise poultry, in order for the pregnant wife buy chicken supplement, visited live bird markets. 22 patients in the phenomenon of high fever, the 25th was sent to the Fuzhou Pulmonary Hospital for treatment, 27 after detecting infection confirmed H7N9. Reporters learned that this is the first case of human infection with H7N9 this year in northern Fujian case, also following the second case was first discovered in 2015 in Nanping cases of human infection with H7N9 after (the first case of human infection with the H7N9 Nanping case has healed).